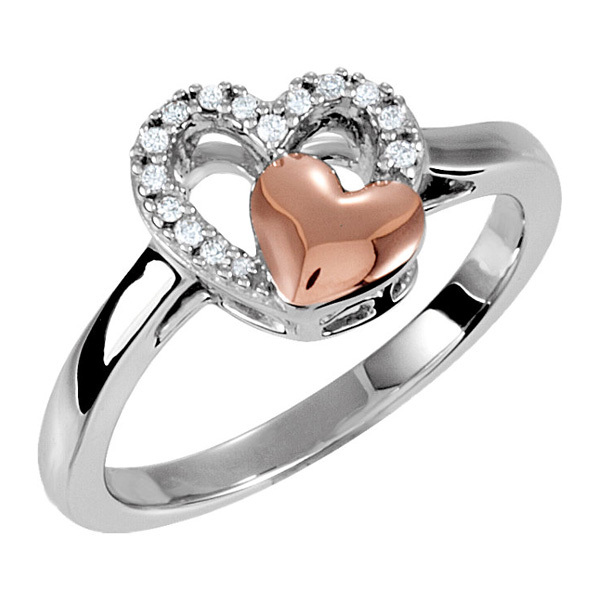 Enjoy a two tone look with this 10K rose gold and silver diamond heart ring from Apples of Gold Jewelry! This lovely ring features a .925 sterling silver band with an open heart on the center. The heart has several diamonds, which are rated H+ for color and I2 for clarity, going around the perimeter. The diamonds total 0.10 carats (1/10 carat), and bring a lot of dazzle to this ring. Inside the center of the heart is a smaller, solid 10K rose gold heart, which adds even more romance and sweetness to the ring. The stunning, soft pink hue of the rose gold stands out against the sterling silver and makes the ring even more exciting! We guarantee our 10K Rose Gold and Silver Diamond Heart Ring to be high quality, authentic jewelry, as described above.